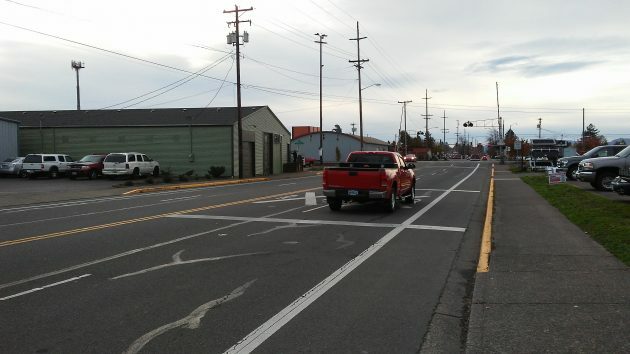 The red pickup is using the lane of Queen Avenue that would disappear under an ODOT plan to revamp the Queen Avenue crossing, in the background. Because it calls for losing a lane on Queen Avenue westbound, Albany City Council members Rich Kellum and Bill Coburn are pushing back against a proposal by ODOT-Rail to add more gates at the Queen Avenue railroad crossing. As a result, the plan got no closer to council approval on Monday. Instead, the council encouraged city officials to ask business owners and employees in dozens of companies along Ferry Avenue S.W. to see what they thought of the idea. Kellum said he had worked on Ferry for several years and made thousands of left turns from there onto Queen, at the intersection where the second lane now starts. He said getting rid of the lane would make left turns that much harder for some 500 people who work along Ferry or nearby. Janet Steele of the chamber of commerce told the council that business — especially Oregon Freeze Dry — was concerned about the effect the street project might have on employees and customers. What ODOT-Rail wants to do is close the right westbound lane for one block from Ferry to the crossing to make room for sidewalk improvements on the north side of Queen. The plan calls for pedestrian gates to keep walkers and people on bikes from going around the street gates while they’re still down. Sometimes they are still down after a locomotive shunting rail cars has cleared the crossing because a through train — invisible from the east and hard to hear because of the crossing bells — is coming along on the mainline. Two men on bicycles have been killed in recent years because they went around the closed gates. Kellum wants the sidewalk upgrades to be done on the south side of the street and ask pedestrians to cross the tracks only there. There is no proper sidewalk on the north side anyway, and installing one outside the existing travel lanes is impossible because of the location of a Union Pacific switch. Coburn wants to know where there’s a pedestrian crossing like the one that’s planned. He’d like to go check how it works. Mayor Sharon Konopa, City Manager Wes Hare and Councilor Floyd Collins favor the project. Hare said the benefits, including safety and work by the UP to smooth the crossing pavement, outweigh the inconvenience of making left turns from Ferry, an already troublesome intersection. Another benefit: ODOT would pay for the project. A simplistic (but likely expensive) answer t0 the wrong problem. Devices don’t solve choice issues. I remember PSAs in the 50s regarding rail crossings. They were tasteful reminders of the outcome of choices. This crossing still has mechanical bells, something that is becoming quite rare at grade crossings. It would be a shame to loose these. And for what, trying to fix stupid? If they wanna improve things there for pedestrians they could build an over pass set up on one side. I am sure most pedestrians will use it if they don’t want to wait down below. Otherwise the next best solution would be to move the whole set up to the old mill in Millersberg.